The pH of all solutions are adjusted to USP limits with sodium hydroxide. Lidocaine stabilizes the neuronal membrane by inhibiting the ionic fluxes required for the initiation and conduction of nerve impulses, thereby effecting local anesthetic action. When used for infiltration anesthesia in dental patients, the time of onset averages less than two minutes for Octocaine Injections. Octocaine Injections provide an average pulp anesthesia of at least 60 minutes with an average duration of soft tissue anesthesia of approximately 2.5 hours.When used for nerve blocks in dental patients, the time of onset for both forms of Octocaine (Lidocaine and Epinephrine) injections averages 2-4 minutes. Octocaine injections provide pulp anesthesia averaging at least 90 minutes with an average duration of soft tissue anesthesia of 3 to 3.25 hours. Excessive blood levels may cause changes in cardiac output, total peripheral resistance, and mean arterial pressure. These changes may be attributable to a direct depressant effect of the local anesthetic agent on various components of the cardiovascular system and/or the beta-adrenergic receptor stimulating action of epinephrine when present. Information derived from diverse formulations, concentrations and usages reveals that lidocaine is completely absorbed following parenteral administration, its rate of absorption depending, for example, upon various factors such as the site of administration and the presence or absence of a vasoconstrictor agent. Except for intravascular administration, the highest blood levels are obtained following intercostal nerve block and the lowest after subcutaneous administration. The plasma binding of lidocaine is dependent on drug concentration, and the fraction bound decreases with increasing concentratlon. At concentration of 1 to 4 Î¼g of free base per mL, 60 to 80 percent of lidocaine is protein bound. Binding is also dependent on the plasma concentration of the alpha-l-acid glycoprotein. Lidocaine is metabolized rapidly by the liver, and metabolites and unchanged drug are excreted by the kidneys. Biotransformation includes oxidative N-dealkylation, ring hydroxylation, cleavage of the amide linkage, and conjugation. N-dealkylation, a major pathway of biotransformation, yields the metabolites monoethylglycinexylidide and glycinexylidide. The pharmacological/toxicological actions of these metabolites are similar to, but less potent than those of lidocaine. Approximately 90% of lidocaine administered is excreted in the form of various metabolites, and less than 10% is excreted unchanged. The primary metabolite in urine is a conjugate of 4-hydroxy-2, 6-dimethylaniline. Studies of lidocaine metabolism following intravenous bolus injections have shown that the elimination half-life of this agent is typically 1.5 to 2.0 hours. Because of the rapid rate at which lidocaine is metabolized, any condition that affects liver function may alter lidocaine kinetics. The half-life may be prolonged two-fold or more in patients with liver dysfunction. Renal dysfunction does not affect lidocaine kinetics but may increase the accumulation of metabolites. Factors such as acidosis and the use of CNS stimulants and depressants affect the CNS levels of lidocaine required to produce overt systemic effects. Objective adverse manifestations become increasingly apparent with increasing venous plasma levels above 6.0 Î¼g free base per mL. In the rhesus monkey, arterial blood levels of 18-21 Î¼g/mL have been shown to be the threshold for convulsive activity. 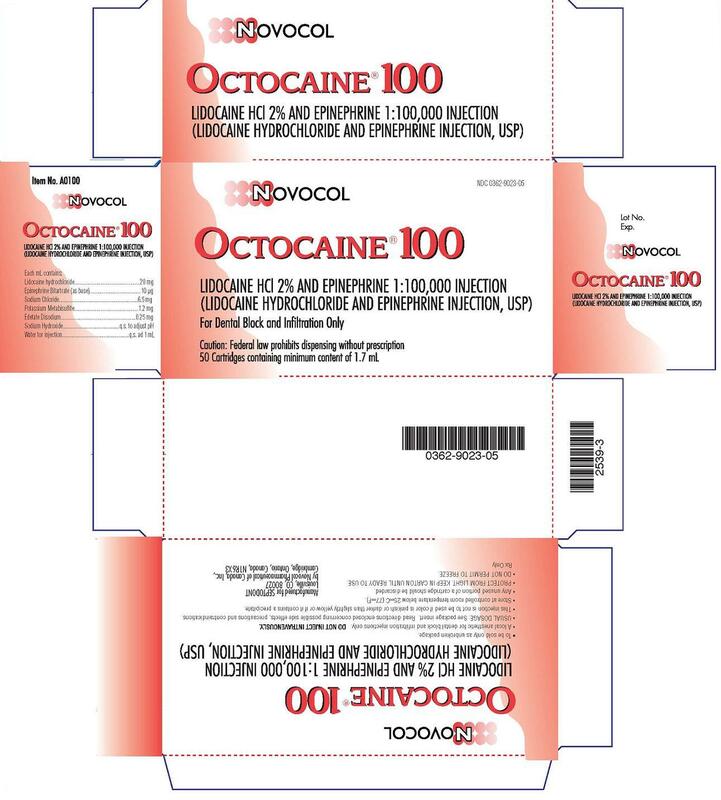 Octocaine (Lidocaine and Epinephrine Injection, USP) is indicated for the production of local anesthesia for dental procedures by nerve block or infiltration techniques. Lidocaine and Epinephrine Injection is contraindicated in patients with a known history of hypersensitivity to local anesthetics of the amide type or to any components of the injectable formulations. DENTAL PRACTITIONERS WHO EMPLOY LOCAL ANESTHETIC AGENTS SHOULD BE WELL VERSED IN DIAGNOSIS AND MANAGEMENT OF EMERGENCIES WHICH MAY ARISE FROM THEIR USE. RESUSCITATIVE EQUIPMENT, OXYGEN AND OTHER RESUSCITATIVE DRUGS SHOULD BE AVAILABLE FOR IMMEDIATE USE. Octocaine Injections contain potassium metabisulfite, a sulfite that may cause allergic-type reactions including anaphylactic symptoms and life-threatening or less severe asthmatic episodes in certain susceptible people. The overall prevalence of sulfite sensitivity in the general population is unknown and probably low. Sulfite sensitivity is seen more frequently in asthmatic than in nonasthmatic people. OCTOCAINE, along with other local anesthetics, is capable of producing methemoglobinemia. The clinical signs of methemoglobinemia are cyanosis of the nail beds and lips, fatigue and weakness. If methemoglobinemia does not respond to administration of oxygen, administration of methylene blue intravenously 1-2 mg/kg body weight over a 5 minute period is recommended. The safety and effectiveness of lidocaine depend on proper dosage, correct technique, adequate precautions and readiness for emergencies. Consult standard textbooks for specific techniques and precautions for various regional anesthetic procedures. Resuscitative equipment, oxygen and other resuscitative drugs should be available for immediate use (See WARNINGS AND ADVERSE REACTIONS). The lowest dosage that results in effective anesthesia should be used to avoid high plasma levels and serious adverse effects. Repeated doses of lidocaine may cause significant increases in blood levels with each repeated dose due to slow accumulation of the drug or its metabolites. Tolerance to elevated blood levels varies with the status of the patient. Debilitated, elderly patients, acutely ill patients, and children should be given reduced doses commensurate with their age and physical condition. If sedatives are employed to reduce patient apprehension, reduced doses should be used since local anesthetic agents, like sedatives, are central nervous system depressants which in combination may have an additive effect. Young children should be given minimal doses of each agent. Lidocaine should be used with caution in patients with severe shock or heart block. Lidocaine should also be used with caution in patients with impaired cardiovascular function. Local anesthetic solutions containing a vasoconstrictor should be used with caution in areas of the body supplied by end arteries or having otherwise compromised blood supply. Patients with peripheral vascular disease and those with hypertensive vascular disease may exhibit exaggerated vasoconstrictor response. Ischemic injury (such as exfoliating or ulcerating lesions) or necrosis may result. Preparations containing a vasoconstrictor should be used with caution in patients during or following the administration of potent general anesthetic agents, since cardiac arrhythmias may occur under such conditions. Cardiovascular and respiratory (adequacy of ventilation) vital signs and the patient's state of consciousness should be monitored after each local anesthetic injection. Restlessness, anxiety tinnitus, dizziness, blurred vision, tremors, depression or drowsiness should alert the practitioner to the possibility of central nervous system toxicity. Signs and symptoms of depressed cardiovascular function may commonly result from a vasovagal reaction, particularly if the patient is in an upright position : placing the patient in the recumbent position is recommended when an adverse response is noted after injection of a local anesthetic (See ADVERSE REACTIONS - Cardiovascular System. ).Vasovagal reactions may elicit a range of clinical manifestations, from pre-syncope (e.g., lightheadedness, pallor, nausea, sweating, visual disturbances, weakness) to brief loss of consciousness (i.e., syncope). Lidocaine should be used with caution in patients with hepatic disease, since amide-type local anesthetics are metabolized by the liver. Patients with severe hepatic disease, because of their inability to metabolize local anesthetics normally, are at greater risk of developing toxic plasma concentrations. Many drugs used during the conduct of anesthesia are considered potential triggering agents for familial malignant hyperthermia. Since it is not known whether amide-type local anesthetics may trigger this reaction, and since the need for supplemental general anesthesia cannot be predicted in advance, it is suggested that a standard protocol for management should be available. Early unexplained signs of tachycardia, tachypnea, labile blood pressure and metabolic acidosis may precede temperature elevation. Successful outcome is dependent on early diagnosis, prompt discontinuance of the suspected triggering agent (s) and prompt treatment, including oxygen therapy, dantrolene (consult dantrolene sodium intravenous package insert before using) and other supportive measures. Small doses of local anesthetics injected into the head and neck area, including retrobulbar, dental and stellate ganglion blocks, may produce adverse reactions similar to systemic toxicity seen with unintentional intravascular injections of larger doses. Confusion, convulsions, respiratony depression and/or respiratory arrest, and cardiovascular stimulation or depression have been reported. These reactions may be due to intra-arterial injection of the local anesthetic with retrograde flow to the cerebral circulation. Patients receiving these blocks should have their circulation and respiration monitored and be constantly observed. Resuscitative equipment and personnel for treating adverse reactions should be immediately available. Dosage recommendations should not be exceeded (See DOSAGE AND ADMINISTRATION). The patient should be advised to to exert caution to avoid inadvertent trauma to the lips, tongue, cheek mucosae or soft palate when these structures are anesthetized. The ingestion of food should therefore be postponed until normal function returns. The patient should be advised to consult the dentist if anesthesia persists or if a rash develops. The administration of local anesthetic solutions containing epinephrine or norepinephrine to patients receiving monoamine oxidase inhibitors, tricyclic antidepressants or phenothiazines may produce severe prolonged hypotension or hypertension. As the Lidocaine and Epinephrine Injections contain a vasoconstrictor (epinephrine), concurrent use of either with a Beta-adrenergic blocking agent (propranolol, timolol, etc.) may result in dose-dependent hypertension and bradycardia with possible heart block. The intramuscular injection of lidocaine may result in an increase in creatine phosphokinase levels. Thus, the use of this enzyme determination, without isoenzyme separation, as a diagnostic test for the presence of acute myocardial infarction may be compromised by the intramuscular injection of lidocaine. Dosages in pediatric population should be reduced, commensurate with age, body weight and physical condition (See DOSAGE AND ADMINISTRATION). Cardiovascular manifestations in response to lidocaine are usually depressant and are characterized by bradycardia, hypotension, and cardiovascular collapse, which may lead to cardiac arrest.In addition, the beta-adrenergic receptor-stimulating action of epinephrine may lead to excitatory cardiovascular responses, such as tachycardia, palpitations, and hypertension. Signs and symptoms of depressed cardiovascular function may commonly result from a vasovagal reaction, particularly if the patient is in an upright position. Less commonly, they may result from a direct effect of the drug. Failure to recognize the premonitory signs such as sweating, a feeling of faintness, changes in pulse or sensorium may result in progressive cerebral hypoxia and seizure or serious cardiovascular catastrophe. Management consists of placing the patient in the recumbent position and ventilation with oxygen. Supportive treatment of circulatory depression may require the administration of intravenous fluids and, when appropriate, a vasopressor (e.g, ephedrine) as directed by the clinical situation. Allergic reactions are characterized by cutaneous lesions, urticaria, edema, anaphylactoid reactions, or dyspnea due to bronchoconstriction. Allergic reactions as a result of sensitivity to lidocaine are extremely rare and, if they occur, should be managed by conventional means. The detection of sensitivity by skin testing is of doubtful value. Persistent paresthesias of the lips, tongue, and oral tissues have been reported with the use of lidocaine, with slow, incomplete, or no recovery. These post-marketing events have been reported chiefly following nerve blocks in the mandible and have involved the trigeminal nerve and its branches. The first step in the management of convulsions consists of immediate attention to the maintenance of a patent airway and assisted or controlled ventilation with oxygen and a delivery system capable of permitting immediate positive airway pressure by mask. Immediately after the institution of these ventilatory measures, the adequacy of the circulation should be evaluated, keeping in mind that drugs used to treat convulsions sometimes depress the circulation when administered intravenously. Should convulsions persist despite adequate respiratory support, and if the status of the circulation permits, small increments of an ultra-short acting barbiturate (such as thiopental or thiamylal) or a benzodiazepine (such as diazepam) may be administered intravenously. The clinician should be familiar, prior to use of local anesthetics, with these anticonvulsant drugs. Supportive treatment of clrculatory depression may require administration of intravenous fluids and, when appropriate, a vasopressor as directed by the clinical situation (e.g., ephedrine). If not treated immediately, both convulsions and cardiovascular depression can result in hypoxia, acidosis, bradycardia, arrhythmias and cardiac arrest. If cardiac arrest should occur, standard cardio-pulmonary resuscitative measures should be instituted. Endotracheal intubation, employing drugs and techniques familiar to the clinician, may be indicated, after initial administration of oxygen by mask, if difficulty is encountered in the maintenance of a patent airway or if prolonged ventilatory support (assisted or controlled) is indicated. The dosage of Octocaine (Lidocaine and Epinephrine Injections, USP) depends on the physical status of the patient, the area of the oral cavity to be anesthetized, the vascularity of the oral tissues, and the technique of anesthesia used. The least volume of solution that results in effective local anesthesia should be administered; time should be allowed between injections to observe the patient for manifestations of an adverse reaction. For specific techniques and procedures of a local anesthesia in the oral cavity, refer to standard textbooks. For most routine dental procedures, Octocaine (Lidocaine and Epinephrine 1:100,000) Injection is preferred. However, when greater depth and a more pronounced hemostasis are required, a 1:50,000 Epinephrine concentration should be used. Dosage requirements should be determined on an individual basis. In oral infiltration and / or mandibular block, initial dosages of 1.0 - 5.0 mL (1/2 to 2.5 cartridges) of Octocaine Injections are usually effective. In children under 10 years of age, it is rarely necessary to administer more than one-half cartridge (0.9-1.0 mL or 18-20 mg of lidocaine) per procedure to achieve local anesthesia for a procedure involving a single tooth. In maxillary infiltration, this amount will often suffice to the treatment of two or even three teeth. In the mandibular block, however, satisfactory anesthesia achieved with this amount of drug, will allow treatment of the teeth of an entire quadrant. Aspiration is recommended since it reduces the possibility of intravascular injection, thereby keeping the incidence of side effects and anesthetic failures to a minimum. Moreover, injection should always be made slowly. Maximum recommended dosages for Lidocaine and Epinephrine Injections. Pediatric patients : It is difficult to recommend a maximum dose of any drug for pediatric patients since this varies as a function of age and weight. For pediatric patients of less than ten years who have a normal lean body mass and normal body development, the maximum dose may be determined by the application of one of the standard pediatric drug formulas (e.g., Clark's rule). For example, in pediatric patients of five years weighing 50 Ibs, the dose of lidocaine hydrochloride should not exceed 75-100mg when calculated according to Clark's rule. In any case, the maximum dose of lidocaine hydrochloride should not exceed 7 mg/kg (3.2 mg/lb) of body weight. NOTE : Parenteral drug products should be inspected visually for particulate matter and discoloration prior to administration whenever the solution and container permit. Solutions that are discolored and / or contain particulate matter should not be used and any unused portion of a cartridge of Octocaine Injections should be discarded. • Octocaine (Lidocaine Hydrochloride 2% and Epinephrine 1:50,000) injection is available in cardboard boxes containing 5 blisters of 10 x 1.7 mL cartridges. • Octocaine (Lidocaine Hydrochloride 2% and Epinephrine 1:100,000) injection is available in cardboard boxes containing 5 blisters of 10 x 1.7 mL cartridges. Cartridges should not be autoclaved, because the closures employed cannot withstand autoclaving temperatures and pressures. If chemical disinfection of anesthetic cartridges is desired, either isopropyl alcohol (91%) or 70% ethyl alcohol is recommended. Many commercially available brands of rubbing alcohol, as well as solutions of ethyl alcohol not of U.S.P grade, contain denaturants that are injurious to rubber and, therefore, are not to be used. It is recommended that chemical disinfection be accomplished just prior to use by wiping the cartridge cap thoroughly with a pledge of cotton that has been moistened with recommended alcohol. Certain metallic ions (mercury, zinc, copper, etc.) have been related to swelling and edema after local anesthesia in dentistry. Therefore, chemical disinfectants containing or releasing these ions are not recommended. Antirust tablets usually contain sodium nitrite or some similar agents that may be capable of releasing metal ions. Because of this, aluminium sealed cartridges should not be kept in such solutions. Quaternary ammonium salts, such as benzalkonium chloride, are electrolytically incompatible with aluminium. Cartridges of Octocaine Injections are sealed with aluminium caps and therefore should not be immersed in any solution containing these salts. Cracking of glass cartridges is most often the result of an attempt to use a cartridge with an extruded plunger. An extruded plunger loses its lubrication and can be forced back into the cartridge only with difficulty. Cartridges with extruded plungers should be discarded. Store at controlled room temperature, below 25°C (77°F). Novocol Pharmaceutical of Canada, Inc.